Life is sweeter with dessert, so I’m starting my posts about Argentina with helado, my most beloved treat as a kid. 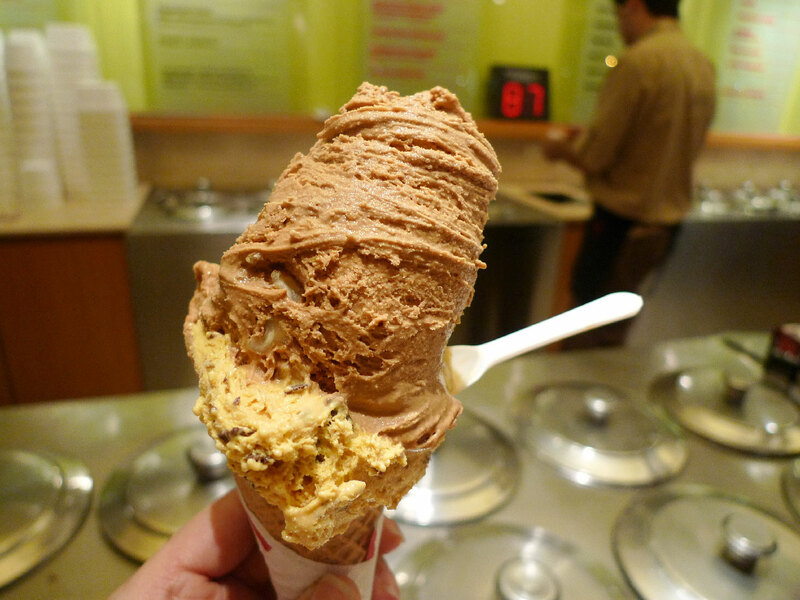 Helado is usually translated as ice cream, but its creamy, smooth, soft texture makes it more gelato-esque. 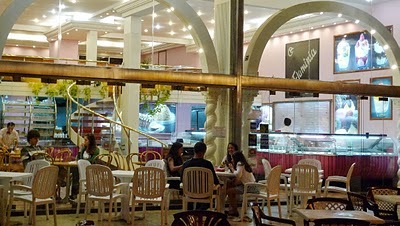 The Heladerias (Local neighborhood gelato shop. 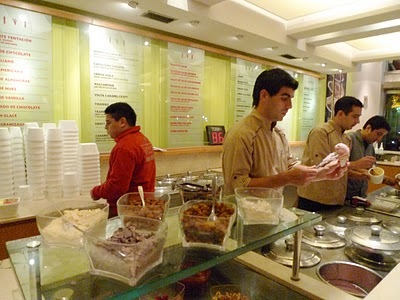 They are everywhere) in Argentina offer Helado Artesanal, which means, each shop makes their own helado with their secret recipes using real ingredients and keeping all things artificial to a minimal. No pints from the super market here. 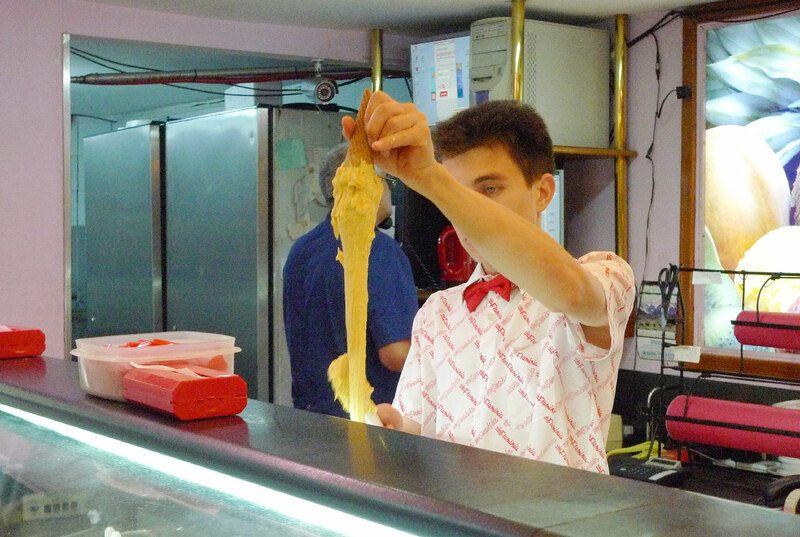 This is why each shop vary so much in flavor, creamyness, textures and ultimately quality. Argentineans love helado so much, you can get it delivered! Yes, delivered to your door by the kilo, like you would pizza or chinese food here. What was once totally normal seemed like such a wild idea this time around. 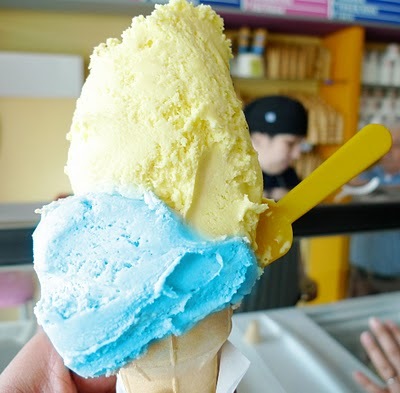 In case your wondering about the picture above, yes, there really is blue helado, the flavor is Crema del Cielo (or cream of the sky, it’s cream and some color). I love how spacious this place is, nice to sit, chill and enjoy. 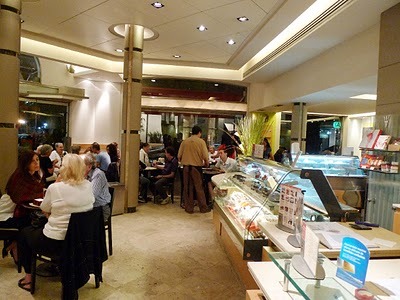 It’s located in a really nice neighborhood, plenty of good restaurants all around. All the flavors with Almonds involved are really good here, the whole almonds are nicely toasted and crunchy. They’re famous for this giant cone dipped in chocolate. When I was told about the unbelievable height, I thought my friends were exaggerating, boy was I wrong. It’s basically an gelato sword. This really takes skills. I think they dip it in liquid nitrogen so it holds up. Sorry about the bad video taking at the end, I was holding that monstrosity and had to pass the camera. And I learned NOT to do videos vertically, it was a pain to turn it. And here we are… mine broke off a little in the making so it’s a little shorter than Tina’s. Hahaha, the look on that guys face cracks me up. I had to stand and eat… yeap, it was either that or sit like Tina, with open legs and attack. Either way, this was a messy affair. 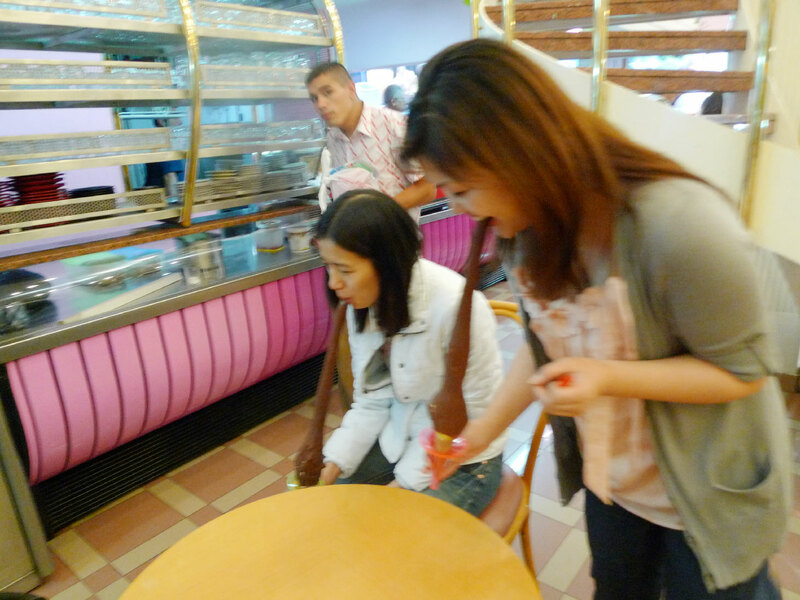 At midpoint… that was a lot of helado! 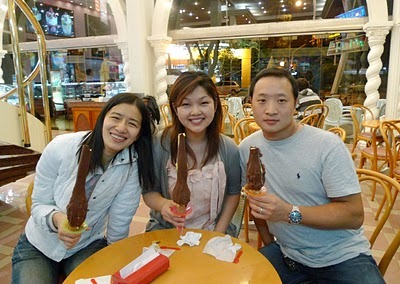 The chocolate is really thick and dense, it melts in your mouth while the cool ice cream hits you. 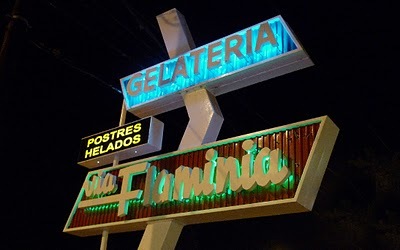 I really liked it, but did I mention this is a lot of helado? None of us really finished it, a hard task to conquer for sure, but loved the experience. Who ever thought of doing this is insane and super awesome. 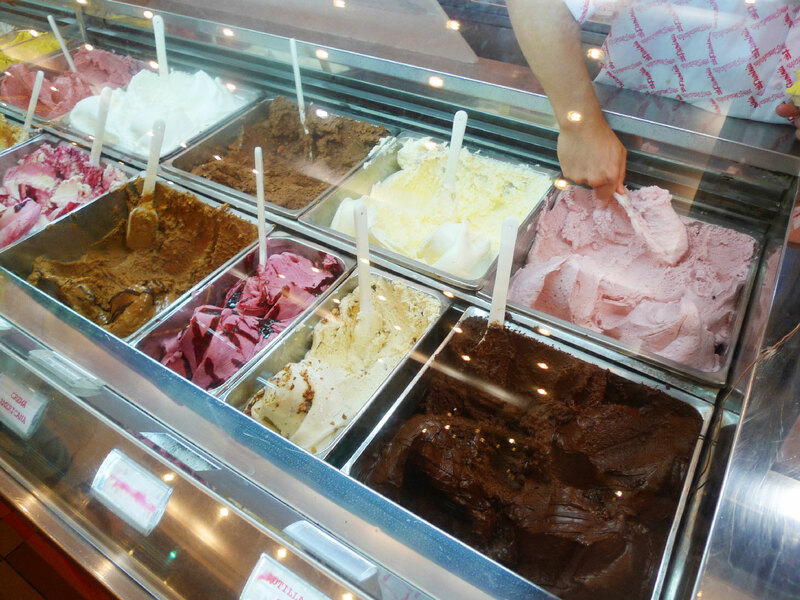 Choose your size, pay and off the the hardest part, choosing flavors. At any point, there are at least 3 guys trying taking orders. 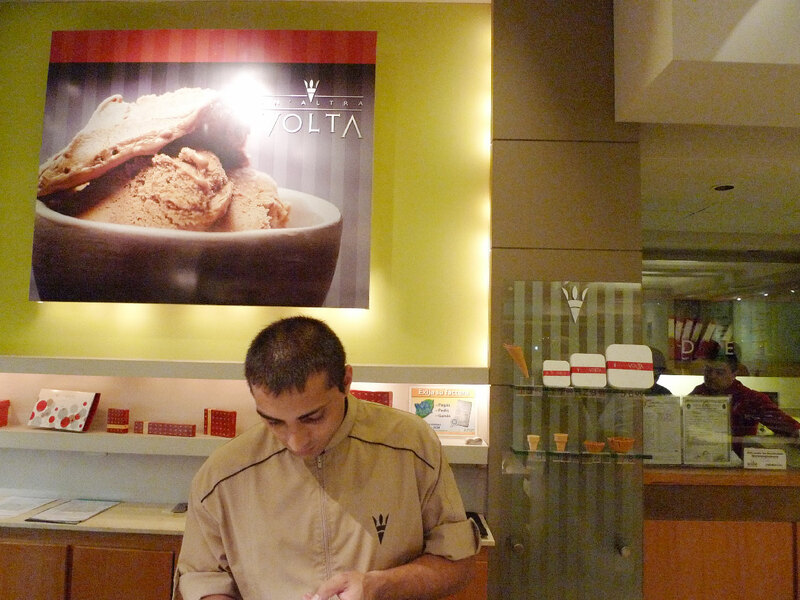 I almost forgot how much I enjoyed having Heladerias everywhere. Great to see all the flavors I grew up with. Being home again, I had to go with the MOST CLASSIC FLAVORS: Dulce de Leche, and Sambayon. The dulce the leche is rich, intense and extremely milky. One lick and I knew I was home. Argentina’s dairy products are truly excellent and therefore, the best dulce de leche is produced, yes there, I said it, the best! I got the Sambayon Granizado, which is made with cream, eggs, sugar and marsala and had bits of dark chocolate. Really creamy, the wine was strong and fragrant, with hints of melting chocolate in every bite. Loved it. Like any other great heladeria, they have nice seating space. Another great thing about being home. It’s all just so chill. 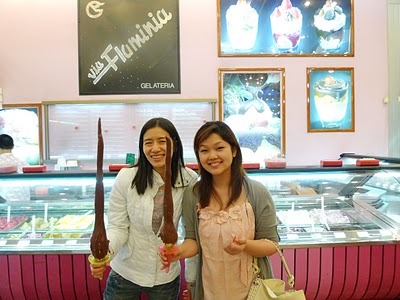 That Gelato Sword is awesome! 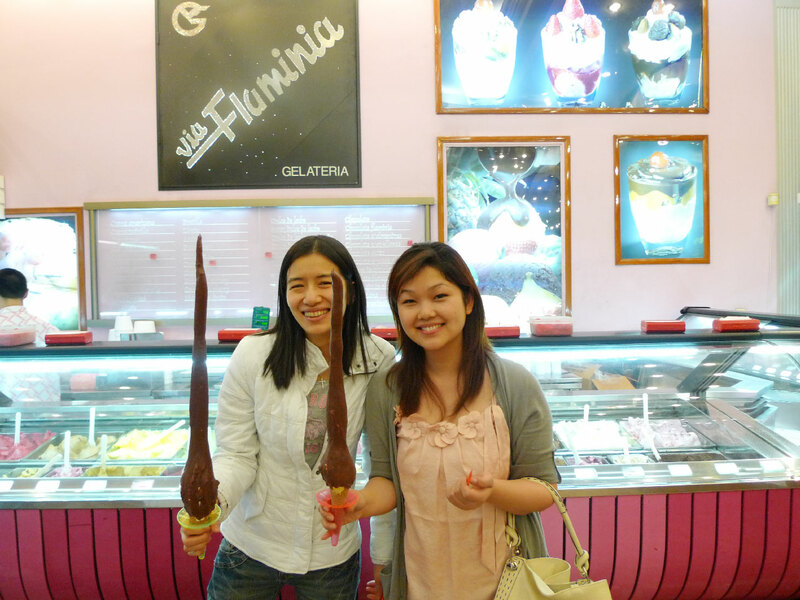 I have never seen anything like that gelato sword. amazing and delicious! Cindy, I love this post! I especially love the picture of you guys trying eat that thing. I have never seen anything like that -it just cracks me up!! looks like a lot of fun! thanx for sharing!! !